Available in multiples of one metre lengths. Usually two players per meter. Common sizes are 3m, 4m, 5m and 6m benches. 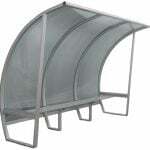 Specially designed for our conditions, the systems include rot resistant aluminium benches, and a special flow through design to allow wind to pass through the shelter alleviating mechanical strain on the structure, and improving player comfort. Available in multiples of one meter lengths. Usually two players per meter. Common sizes are 3m, 4m, 5m and 6m benches. When only the best will do. These European player shelters are used in major stadiums across the world and come with the highest levels of refinement. Options include heated leather seating, embroided club logos on the upholstery and rain curtains on the front. Please call to discuss your Stadia requirements. 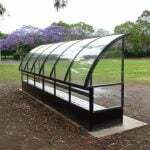 HiTech Sports supplies a range of stackable aluminium team benches in various sizes from 1.8m, 2.4m, 3m and 6m long. Extra strong and stable. Rigid design.